No matter the holiday you celebrate, spending the holidays abroad is something that everyone should do at least once. Three years ago I lived and studied abroad in Macerata, a medieval hilltop town in Le Marche region of Italy. Unlike well-known regions like Tuscany, Emilia Romagna, and Lazio, Le Marche is remarkably tourist-free. It's a breathtakingly beautiful and quiet region stretching from the Appenine Mountains to Adriatic beach towns. Macerata boasts a few beautiful churches, a university founded in 1280, and a world-class opera amphitheater, but remains a close-knit, sleepy university town perched up on a hill. While I could have spent my time in the big cities, Macerata felt like my Italian home away from home. On a clear day from my apartment just outside of the walls, I could see the Adriatic Sea about a 30-minute drive away. I loved watching the seasons change in Macerata. Summer, Fall, Winter— no matter the season it was always beautiful. One of my favorite parts about spending the holidays in Macerata was that the town was nearly void of the advertisements or the typical holiday commercialism that bombard us every December in America. As one may predict, medieval hilltop towns aren't exactly equipped with endless outlets and power sources to deck the halls Clark Griswold-style. Macerata didn't even receive electricity and running water in every home until the 1980s. 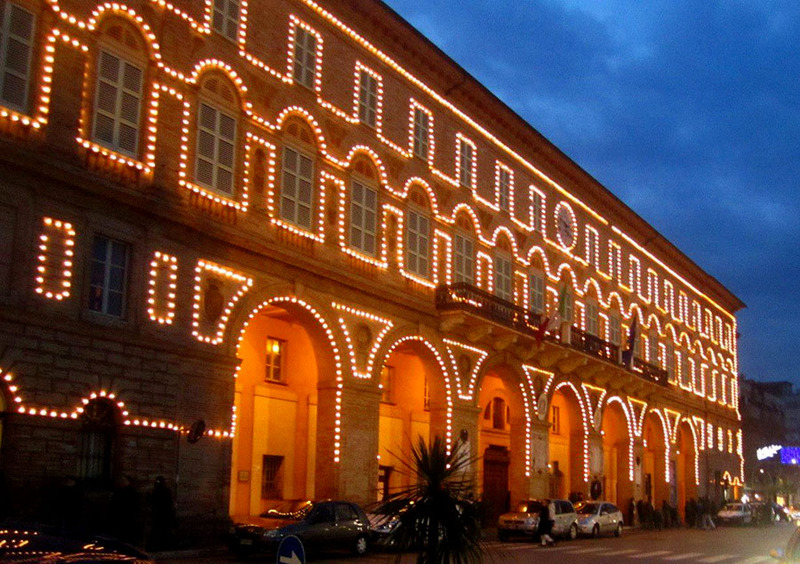 And so, the elegance of celebrating the holidays in Macerata was in its simplicity. Every day that I walked through Macerata that December, I was reminded of the beauty of celebrating Christmas in Italy— a Christmas tree in the main piazza, star lights sparkled above the main streets, shops decorated their storefront windows with chocolate displays and nativity scenes, and for one weekend, the entirety of the city within the walls turned into one sprawling Christmas market filled with local antique sellers and artisans. It wasn’t Christmas overkill. It was just simple and elegant. As we grow older the holidays start to lose their meaning in other ways. The magic and excitement we felt as children is replaced by worrying about everything we need to do before the holidays even arrive. The holidays become more of a check off the to-do list, rather than a time of celebration. My first time experiencing the holidays abroad in Italy, I felt like a kid again. Suddenly everything about the season— the festivals, the Christmas market, the beautiful lights— it was all new and exciting. Experiencing another culture’s traditions helped spark the joy of the holidays and to re-prioritize my own traditions in more ways than one. There are so many reasons to celebrate holidays abroad, but this has to be one of the best. One of the biggest lessons I learned during my time in Italy was learning how to slow down and focusing on my time spent with family and friends. The most convenient convenience store in Macerata is located just outside of one of the central piazzas, Piazza della Libertà. As it happens, the store was closed for every saint or feast day, which, (being that this is Catholic Italy and it was December) denotes nearly every single day of the month. Now, I'm not sure if the family actually observed each holy day or if they simply took it as an excuse to close up shop. (They were hardly ever open so I never got the chance to meet them and find out.) But after I got over my frustration of just trying to buy a pack of stamps, I began to appreciate that this family prioritized their time spent together over everything else. Their commitment to each other and to their community was really refreshing. La Passeggiata is a popular time in Italy where families gather together on Sunday evenings (typically) and take a walk through the neighborhood. Although La Passeggiata is a year-round custom, it seemed to be particularly special during Christmastime. 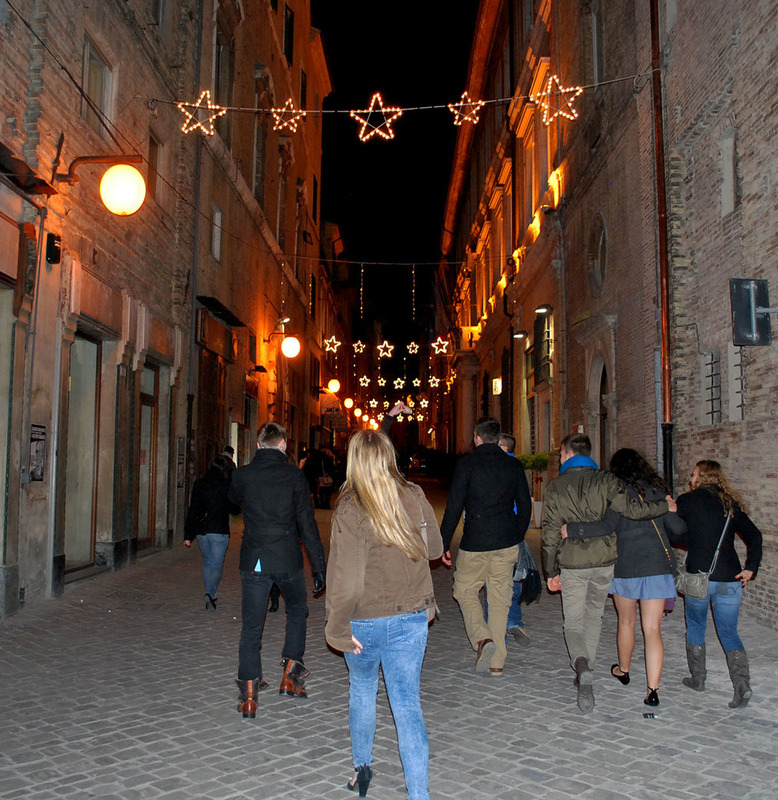 Everyone from Macerata bundled up, strolled around the centro storico, chatted with neighbors, and waved hello to their favorite shopkeepers underneath the Christmas lights. Sometimes we would stop for a glass of wine or pop into our favorite cozy, artisan chocolate shop, Magna Cacao, for a cup of the best hot chocolate this world has ever seen. La Passeggiata is one of the cultural parts of living in Italy that I miss the most. It was all about gathering with friends and neighbors, and just spending time together. After my last Passeggiata in Italy, everyone in the community gathered for mass and then a festival around a roaring bonfire in the center of the piazza. Multicolored candle lanterns were passed to the crowd, everyone sang Christmas songs, and the children held hands and danced around the fire. My American heart grew three sizes that day. In talking with my friends about their favorite Macerata holiday memories, my friend Matty also loved feeling welcomed into the community at the festivals. My friends from studying abroad are still close and keep in touch often. We all have different stories of why we loved the holidays in Italy, but the underline theme from our stories is one of above and beyond generosity from our Italian friends and host families. One of my favorite stories is from my friend Shannon who became like a daughter to her host family in Italy. Her host family graciously decorated their home and served a special Christmas Eve dinner a week early so that she could celebrate with them. Whether it was times spent with our host families, close friends, or even strangers, the spirit of giving in Macerata was so apparent that I was continuously blown away by how generous everyone was with their time and unexpected but thoroughly thoughtful gifts. On one of our last nights in Italy, my friends and I met in the loft of our favorite coffee shop/ bar. The table next to us, all Italian students of the same age, were celebrating Christmas with their university friends before they all were to go home for the holidays. They asked us if we were American and if we had ever tried panettone, the traditional Italian Christmas fruitcake. They shared their cake with us and we ended up spending over an hour talking with them and telling stories. That's the spirit of giving and graciousness that I found while spending the holidays in Italy. No matter what holidays you choose to celebrate, there is so much that can be learned from spending one abroad. The new traditions, the spirit of giving, the sense of community, and getting back the meaning of Christmas during my time in Macerata has always been one of my favorite memories. To my Italian friends who may be reading this, you made all of our holidays so special and we could never thank you enough. Grazie mille. Have you ever celebrated the holidays abroad? Let me know in the comments. Happy holidays and Buon Natale! P.S. Next week's hint? A New Year's Day tradition that's taking 2015 to the next level.